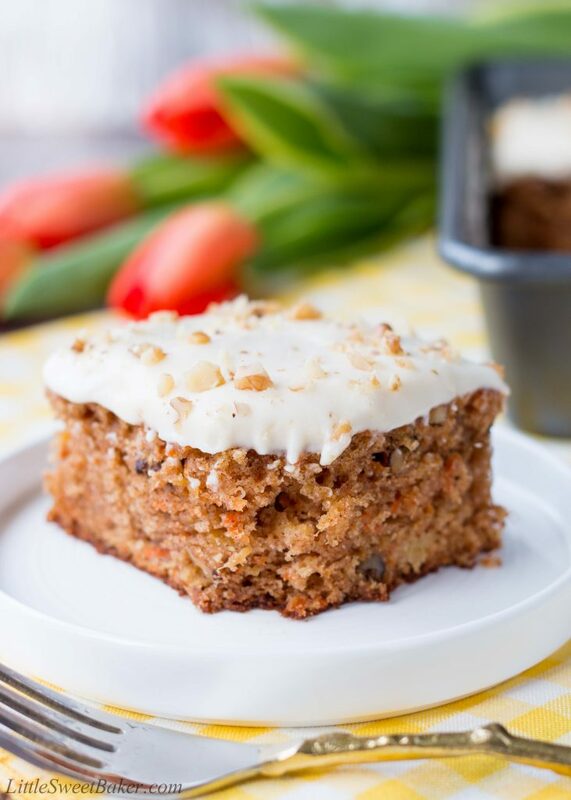 This delicious and easy carrot cake is moist and tender. It’s speckled with shredded carrots, crushed pineapples, and walnuts and topped with a sweet-tangy cream cheese frosting. 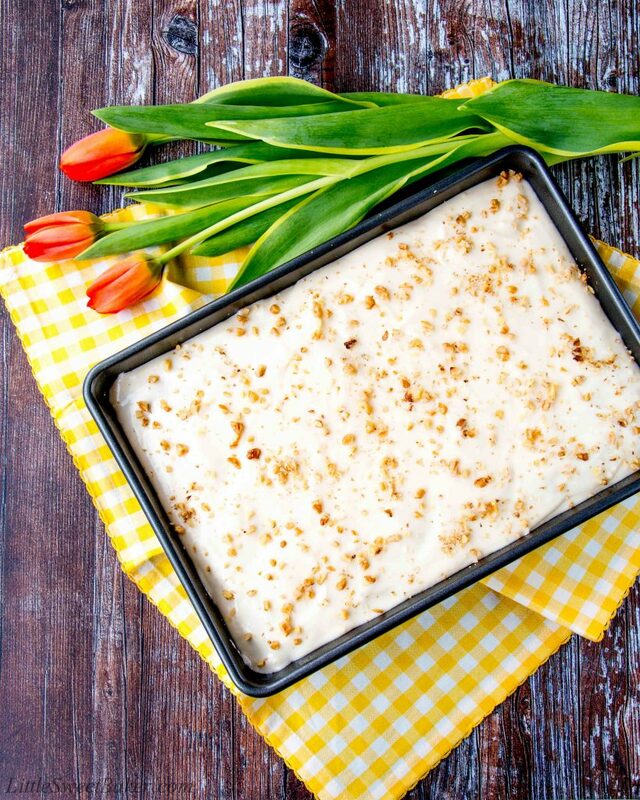 It just ain’t spring without carrot cake, eh? Why is that? 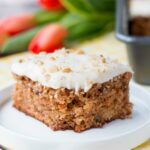 The spices in carrot cake give it more of a fall/winter feel and carrots are a fall vegetable. Hmm…if you know the answer or have any insights, please let me know. Anyhow, no matter what the reason is, you know spring is here and Easter is around the corner when you start to see carrot cake recipes pop up online everywhere. I chose this one from Canadian Living called “Canada’s Best Carrot Cake” (I’m such a sucker for marketing). 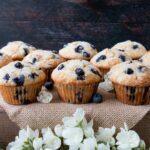 The ingredients were simple and the recipe was straightforward. 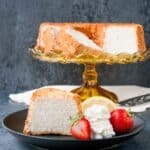 I liked that it’s baked in a 13×9″ pan, which makes it easier to frost and serve versus a layer cake. 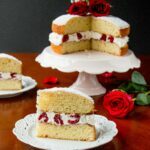 Though you could easily adapt this recipe for a layer cake if you’d like. It’s interesting that carrot cake doesn’t taste like carrots at all. Instead the carrots serve to add moisture and texture to the cake. The extra benefit of adding healthy carrots to a cake also means you can justify having that extra slice (kidding but not kidding lol). 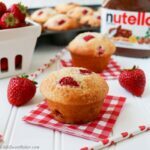 The walnuts are optional, but I highly recommend them because they add a lovely crunchy texture to the soft cake crumbs, and a nutty taste which pairs well with the sweetness from the frosting. I like pineapple in my carrot cake. I find it adds a light-tropical flavor to the cake which makes it suited as a spring dessert. However, if pineapple aren’t your thing, then you can substitute it with raisins if you prefer. 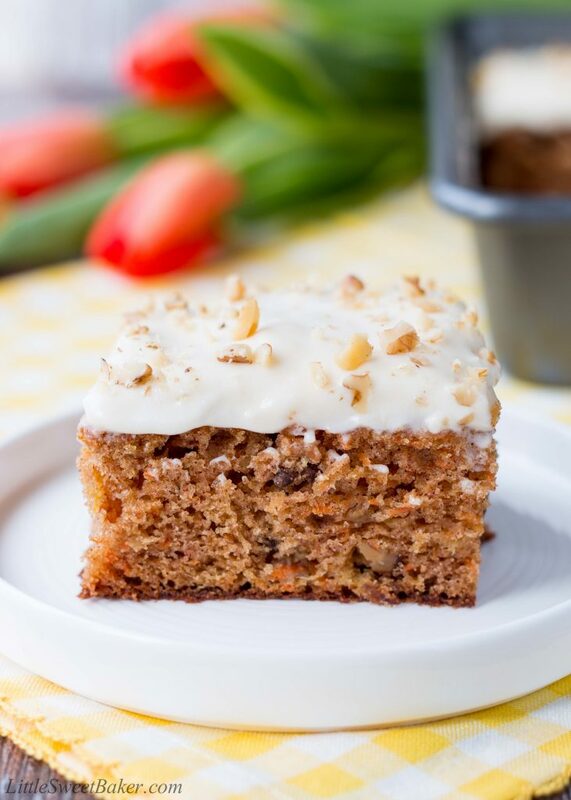 This carrot cake is soft and fluffy with warm notes of cinnamon and nutmeg. It has layers upon layers of wonderfully harmonized flavors from nutty to sweet and spicy. The cream cheese frosting gives the cake a smooth, sweet and tangy finish. Preheat oven to 350F. Grease and flour a 13×9″ cake pan; set aside. In large bowl, whisk together flour, baking powder, cinnamon, baking soda, salt and nutmeg. In separate bowl, whisk together granulated and brown sugars, eggs, oil and vanilla until smooth. Add to flour mixture and stir just until moistened. Fold in carrots, pineapple and pecans. Pour and spread into prepared baking pan. Bake for 35-40 minutes or until cake tester inserted in centre comes out clean. Let cool completely before frosting. Beat the cream cheese and butter until smooth. Beat in the vanilla and salt. Then beat in the powdered sugar one cup at a time until you reach your desired consistency. Spread over top of cake. Leftovers can be tightly covered and stored in the fridge for 3-4 days.